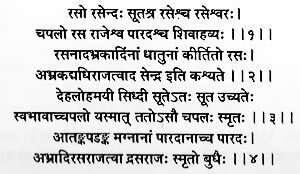 Rasa, Rasendra, Suta, Chapal, Rasraj Simal, Jeev, Jivak, mercury .apart from these synonyms all other names denoted with respect to Lord Shiva are also used as its synonyms. According to scientific aspect mercury is known as atomic energy (Atom), according to Ayurvedic philosophy mercury is considered to be the most important drug with respect to treatment. Mercury can be used for treatment of all diseases. Because of mercury one can attain good health and strong body. Properly purified and solidified mercury helps for treatment of all diseases, if it is converted into Gutika form (Pill) it leads to Mukti (Salvation), in Mrut (Powder Form), Bhasma consumption leads to longetivity of life that is the reason mercury is considered as the best medicine. Mercury is considered as one of the best and important metal. Although mercury is extremely mobile, instable , even then it has some special properties, that is the reason why ancient Ayurvedic Aacharya's have termed mercury as "Pran" i.e. Life or "Aaatma" i.e. soul (Properties of mercury). Jala Gati: It is as mobile as water. Mala Gati: When mercury is triturated with other herbal medicines, during the process some fine dirt particles move along the surface along with Mercury particles. Hansa Gati: During transfer or mixing of mercury with other materials it spills into tiny particles. Dhuma Gati: During various sanskar done on mercury like Jaaran (Burning), Maaran, it smokes out. Jeev Gati: also called as Adrushya Gati in these Gati, just as the soul moves from the body and a person doesn't know. Above mentioned Gatis even if they are stopped even then Para gets disappeared. It is because of these Gatis that Para helps in the treatment of bodily diseases and thereby gives new life to an individual. Thus it is also denoted as "Jeev". 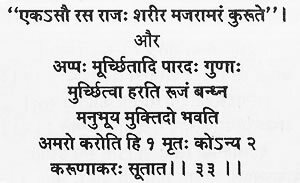 Out of the 5 Gatis of mercury we can practically observe 1st four Gatis of mercury but not the 5th (Adrushya Gati) which is also denoted as Daivik Gati, spiritual procedures like Sidhha Mantra, Dhyan (meditation), Yoga, can stop these Gati just as the soul leaves a human body. The amount of the foreign metal in the mercury alloy with the added material (The Amalgum) was approximately calculated from the measurement of the density of the Amalgum. The density (as you know) is the ration of the mass to its volume. Considering the density of the metal mercury to be 13.55 (as seen from the literature), it appears that the impure metal is present to the extent of less than 1% (very little amount). No estimate of the good, if any, present in the sample can be done by the usual goldsmith method (i.e. employing the goldsmith stone) normally employed in such an examination. Parad Shiv Ling Available in different Sizes and for the different purposes. We can customize any kind or form of Purified and Solidified Parad Object. For details contact us. 1. Parad Shivling is brittle. 2. Avoid contact with Gold Ornaments as it is in pure live form. "Parad shivling when worshipped with proper procedure, belief, and enthusiasm helps people physically, spiritually, and psychologically. 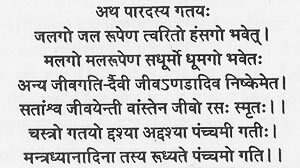 Also protects people from natural calamities, disaster, external evil effects. Some of the reference in the ancient texts of ayurveda and mythological origins which justifies this belief. Get more information on Importance of the Parad Shivling"
Book published with complete details on Parad Shivling from Navjeevan Arogyadham in Hindi & Marathi languages.